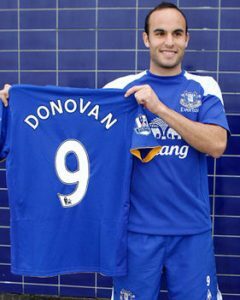 There’s a strong argument to be made that the first Everton number 9 was the best. 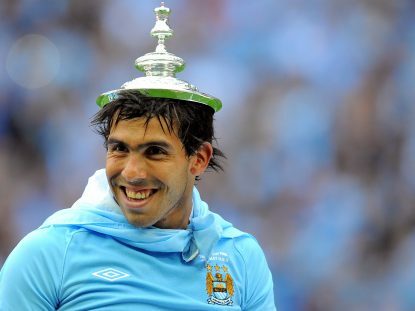 However, he only wore it once and he might have ended up wearing 14 instead. 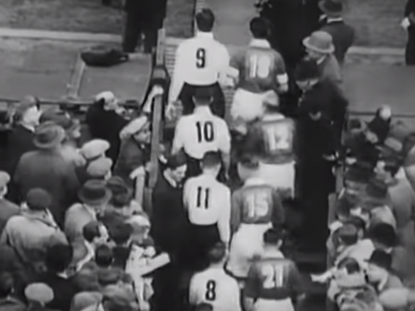 In 1933, the FA decided to experiment with shirt numbering for the FA Cup final between Everton and Manchester City. 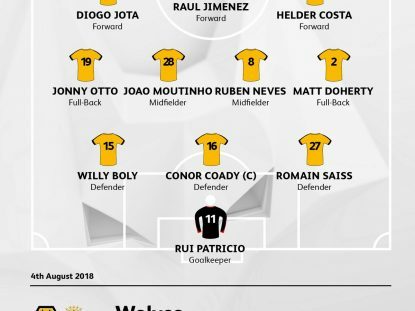 Instead of both sides lining out 1-11 though, it was only the Toffees who were in what would become the conventional format, with City’s players numbered 12-22, from outside-left to goalkeeper. Their centre-forward, Alec Herd, wore 14. Everton captain and number 9 William Ralph ‘Dixie’ Dean scored the second goal in a 3-0 win, one of 395 in 447 games between 1924 and 1937. 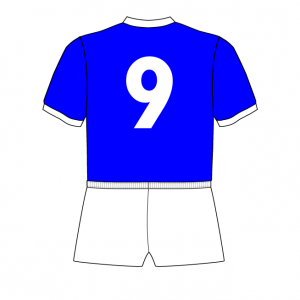 Two years later, the Football League finally permitted teams to use numbers and, ever since then, the Toffees’ number 9 has been a heavy mantle to carry. Tommy Lawton, the player to replace Dean as centre-forward, was the league’s top scorer in 1937-38 and 1938-39, but the second world war impinged on his career. 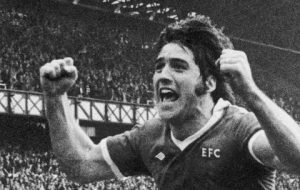 Later, Bob Latchford came closer than most, with 276 games yielding 138 goals from 1974 until 1981, including winning a £10,000 prize from The Daily Express newspaper for being the first player in 1977-78 to reach 30 league goals. 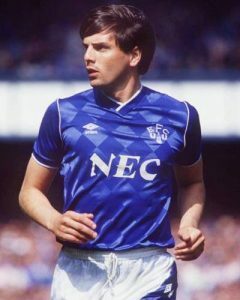 Since Latchford, Gary Lineker in 1985-86 is the only Everton player to have finished as top scorer in England – but the Match of The Day presenter wore 8 in his sole season with the club. 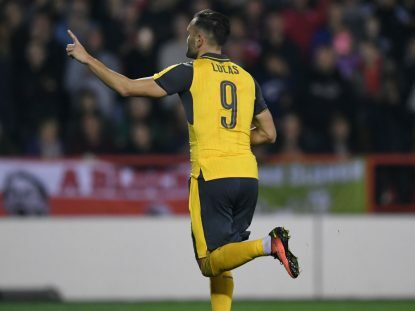 In fact, the last time he wore 9 in a competitive game in England was for Leicester City against Watford on December 12, 1982. 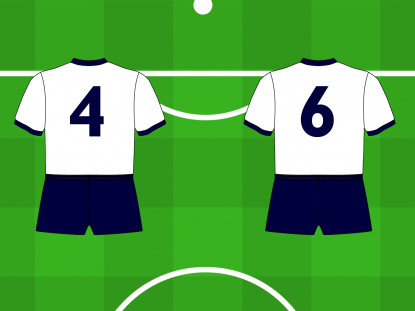 Everton played four FA Cup finals in the 1980s, with Graham Sharp wearing 9 in three of them – the odd one out was 1985, when he wore 8 with Andy Gray 9. The pair had been 9 and 10 respectively in 1984 but this time midfielder Paul Bracewell was 10. 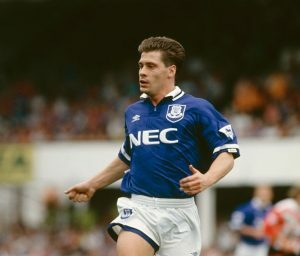 In 1989, against Liverpool, Sharp – scorer of 157 goals in 446 games for Everton – was partnered up front by Tony Cottee, who had joined from West Ham United at the beginning of that season for £2.2m. As he had done at West Ham, Cottee wore 10 for all of 88-89, 89-90 and 90-91 – apart from two games in 8 – with 9 occupied by Sharp and Mike Newell. Cottee did wear 9 in some games in 1991-92, with new signing Mo Johnston and, oddly, left-winger Peter Beagrie among those he shared it with. 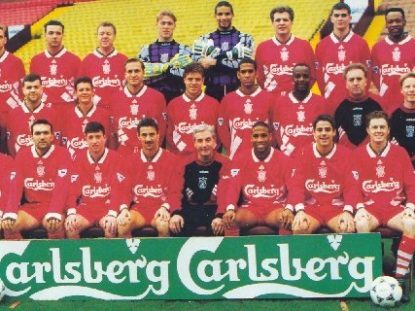 The final season of 1-11 and the first of the new Premier League, 1992-93, saw Cottee wear 10 in his first five starts – Paul Rideout, Stuart Barlow and defender David Unsworth wore 9 – but, after the Coventry City game on October 17, 9 was the only number he wore as a starter and it was what he was given as a squad number for 1993-94. A hat-trick in an early-season game against Sheffield United helped him to 19 goals in 46 games that season but, after just three outings at the start of 1994-95, he returned to Upton Park. That October, the number 9 was filled as Duncan Ferguson was signed on loan from Rangers, just over a year after joining the Gers for what had been a British transfer record of £4m. Having replaced Mike Walker as manager in November, Joe Royle made the move permanent in January and Ferguson was used as a substitute as they beat Manchester United in the FA Cup final in May – the last Everton number 9 to win a medal. While never a prolific scorer, he was a key member of the team and he had scored 34 goals in 142 times by the time he joined Newcastle United for £8m in November 1998. 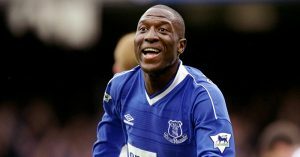 Four months later, Kevin Campbell was signed on loan from Trabzonsport and given the number 9, scoring nine goals in eight games as they moved clear of relegation worries. Campbell signed that summer and stayed for the next five and a half seasons. 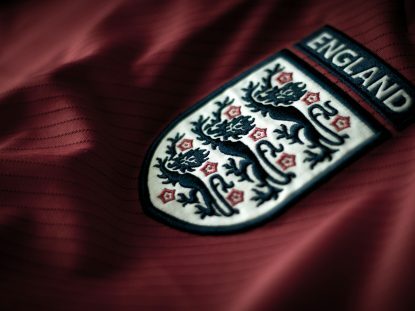 The striker, who has the unwanted record of being the Englishman with the most Premier League goals without having won a full international cap, scored 51 goals in 164 appearances. 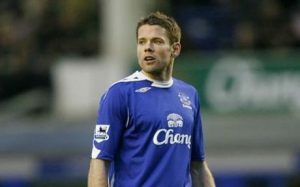 On August 8, 2005, James Beattie – who had worn 8 in 2004-04 after signing from Southampton – gave an interview to the Independent and in it he expressed the desire to inherit the famous digit, now empty after Campball had left. If I can recreate what I did at Southampton then I know the Everton fans will love me. 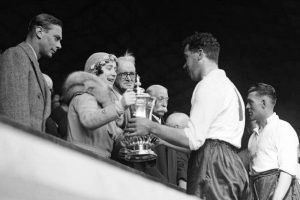 If I can get the number 9 shirt here and start doing what I did towards the end of my time at Southampton where I was captain and scoring goals freely, and I know I can, everything – the price tag, the expectations on an Everton number 9 and the problems of last season – will disappear. The following day, Everton published their squad numbers for the new season but instead 9 was given to Duncan Ferguson, who had worn 10 during the second part of 04-05 after he had re-joined from Newcastle. 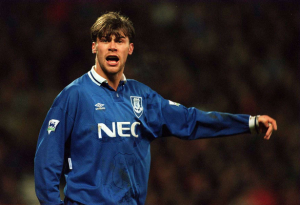 The campaign was to prove to be Big Dunc’s swansong and he struggled, scoring only once in 33 games. Beattie got 11 in 38 and he belatedly had his wish granted as he was handed 9 for 2006-07 – new signing Andy Johnson took 8 – but the change didn’t lead to greater things as Beattie managed just two goals in 35 outings. 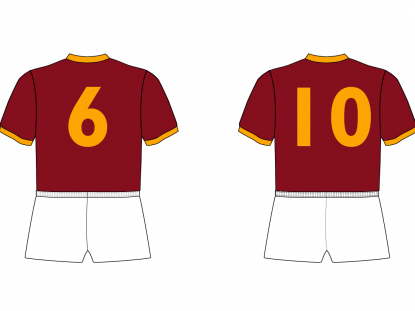 While Beattie departed in the summer of 2007, nobody claimed the number 9, but for the 2008-09 season it went to Louis Saha, newly arrived from Manchester United. 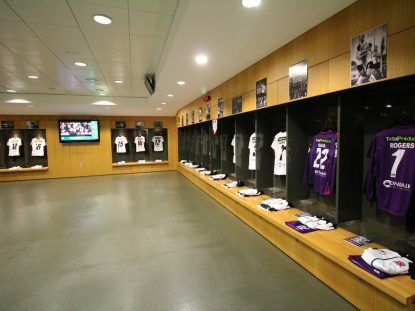 The Frenchman had worn 9 at Old Trafford too but his best Premier League goalscoring season had come while wearing 8 at Fulham in the first half of 2003-04 and it was to 8 he switched after just a season, with its previous holder, midfielder Segundo Castillo, having left. 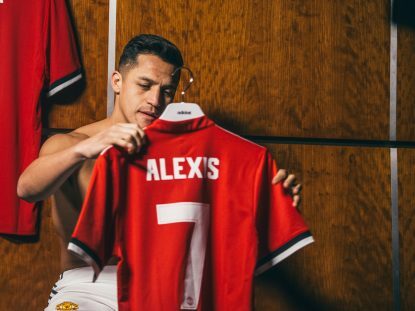 I have always favoured the number 8 jersey throughout my career but for one reason or another it has never been available. 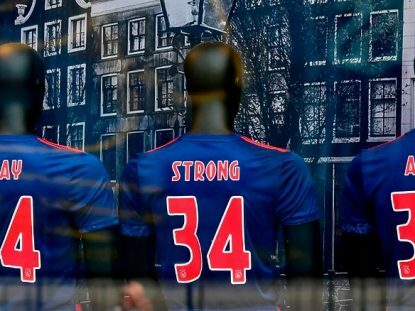 When I arrived at Everton last year, I wanted to take it, but Casti had just arrived and that wasn’t possible. 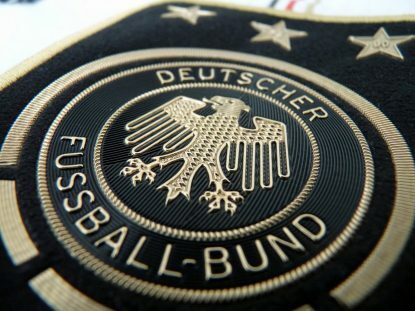 This season it is available and because I was born on the eighth day of the eighth month, it is a number I do associate with. 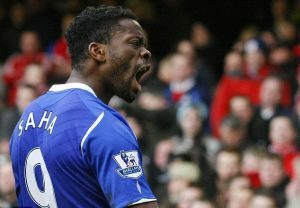 Having scored eight in 29 games in 2008-09, the change to number 8 saw him score 15 in 40, including 13 in the league – the only time he would reach double figures in his four seasons at Goodison. 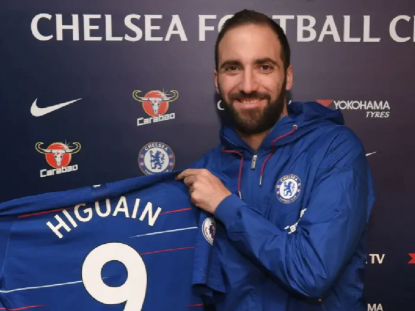 While he had his favoured number, there were no takers for the vacated 9, which lay empty until the loan signing of the Landon Donovan in the January 2010 transfer window. 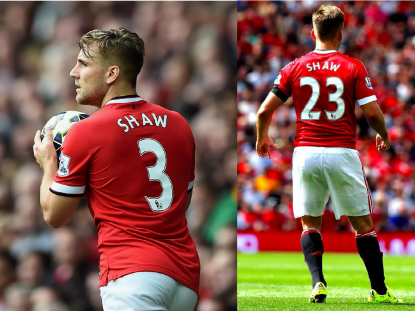 The American would join on a similar deal in 2011-12 and again took 9, with nobody having worn the number in between. 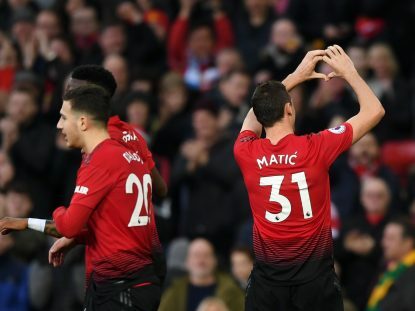 Two goals in 22 games isn’t bad, given that he wasn’t a true centre-forward. 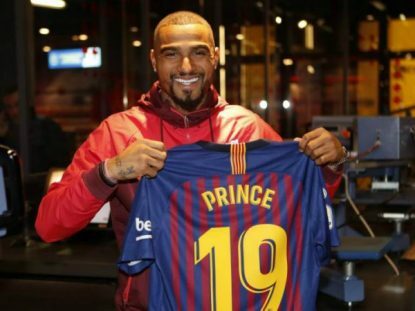 With the number 9 vacant again in 2012-13, it meant that there were four full seasons without a permanent owner for the shirt until the signing of Arouna Koné from Wigan in the summer of 2013. 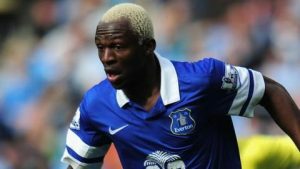 The Ivorian attacker had worn number 2 at Levante and Wigan Athletic and also carried it for his country but submitted to convention at Goodison. However, injury problems meant that he only played 61 games across four seasons, scoring ten times. 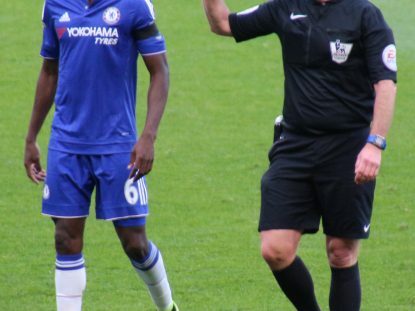 During Koné’s second season, the club signed Samuel Eto’o, who wore 9 for most of his career, but he took 5 and it represented the number of games he needed per goal in his half-season as he notched four in 20. 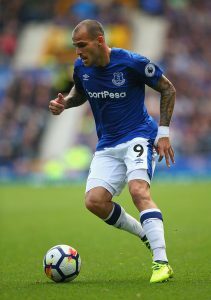 After Koné left, Ronald Koeman made Sandro Ramírez Everton’s new number 9 in the summer of 2017. 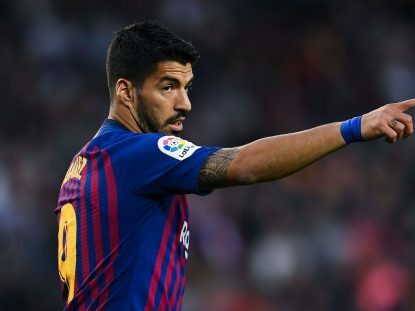 The Spanish attacker – though not really a striker – had worn 19 for Barcelona and Malaga, as well as 29 at Barça, but the drop downwards didn’t really work out for him. 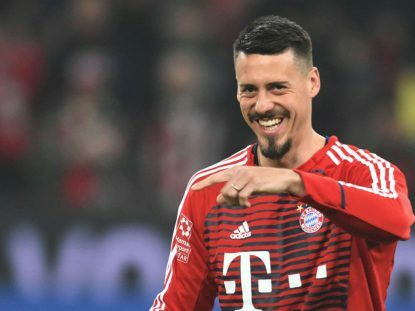 One Europa League goal was all he had to show for 15 games in the first half 2017-18 before a loan move to Sevilla, where he failed to score in 18. 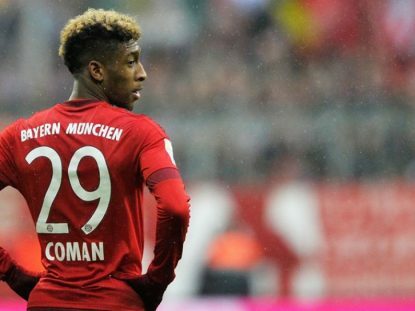 In the summer just gone, he made another loan move, this time to Real Sociedad. 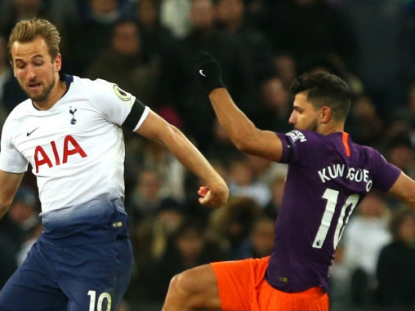 It’s unlikely that he will be back at Everton – Toffees fans will hope that the next number 9 enjoys better fortune than him, and most of the recent incumbents. 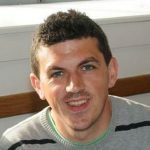 Denis is a freelance journalist and founded the original Squad Numbers blog.